Personal Statement: Matthew Hackenberg is a registered nurse and Director of Innovation Implementation for the Center for Clinical Innovation in the Institute for Advanced Application. Matthew has completed a fellowship in Biomedical Informatics with the National Library of Medicine and earned his certificate in Nursing Informatics through Eastern University. 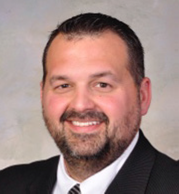 Matthew Hackenberg is presently a Director of Innovation Implementation for Geisinger Health System in Central Pennsylvania. Matthew is responsible for deployment of innovation and best practices including technology and operational solutions in both primary care and specialty service lines. Matthew has implemented programs for virtual visits, patient-reported data collection, optimized clinical notes, and other solutions to support operational needs and primary care innovation. Matt has been a collaborator and consultant for the Chief Health Information Officer on the development of Geisinger clinical information systems. Matthew has completed a fellowship in Biomedical Informatics with the National Library of Medicine and earned his certificate in Nursing Informatics through Eastern University. Why this project is important to me: As a nurse, I strive to see that patients receive the highest quality care, at the right place, right time and from the right care team member. We have an opportunity to introduce innovative solutions to achieve this goal through process redesign and technology.